I ate it and it was better than I suspected it would be (my taste buds have really changed dramatically, which I’m sad about). The carrots and the fruit cup went down too. I didn’t take a picture of my trash because I plain forgot. I’m rushing through lunch these days. On the bright side I think that’s my last school pizza until the Fall! I ate 17 pieces of school pizza this year…. Way more pizza than I ever normally eat. HOWEVER… I think I twittered about having a craving for pizza delivery a couple weeks ago. For me that was really quite odd since we get pizza delivered once every few years. But I got my wish earlier this week when we ordered two large pizzas because of a promotional flyer we got in the mail. Needless to say they were delicious. My favorite one was the bacon and black olive pizza. I’m sure it was bad for me, but it was so good. I’m really wondering what happened to me and if I can get back to normal one day. I made an appointment to visit the doctor next week Friday (my last day of work — kids are done Wednesday). I’m going to have a discussion with him about the project and tell him I would like a follow-up blood test. I’m going to ask for a fasting glucose test to see how I process sugar as compared to my previous results. Going over my medical records, I realized that not only do I have the results of my blood work from 2009, but I have 2008 results too. Every year I submit to blood work and get a physical to receive a discount on our insurance. In December 2009, the doctor noted that my “good” cholesterol was low, but thankfully my overall cholesterol is in the normal range (my total cholesterol was 158 mg/dl in December 2009 and 164 in December 2008). I’m not worried about my cholesterol increasing with increased school lunch consumption (it seems like they aren’t very fatty), but I’m curious about my glucose (my glucose was 82 mg/dl in December 2009 AND the same number in December 2008). I’m anxious to see how I do this time around. The most common question I get as it relates to school lunches is “Have you gained weight?” No. I have not gained weight. In fact I think I’m down two pounds from my “pre-project” weight. But I have become much more cognizant of what I’m eating in school and out. I read that if you keep a record of what you eat every day you have a good chance of losing weight. Well, this is one hell of a warped food diary. Doing this blog project has changed my life. I’m going to spend a lot of my summer thinking about where I should go from here after the project ends. Thanks for reading and participating you guys! One of the coolest things about the project is that you have taught me things and the blog evolved in response to what you told me. For me it was very interactive especially in the beginning when I dived right in without a clue. All I knew was that what the kids at my school ate was bizarre and came in strange packages. It just didn’t feel like real food. Here I am 98 lunches later and I’m still processing this whole experience: what I eat every day and the “notoriety” of the blog. What a wild ride for one small person! Suggestion: ask your dr for the A1C test. It's a blood test that shows–basically–a 3 month (I think) average of your blood sugar. It's a much more accurate predictor of whether you are at risk for diabetes. The fasting glucose test just shows what your sugar is at that moment–not an average of your day or recent history. "Normal"/non-diabetic A1C is under 5.0. Diabetes is diagnosed at 6.0. A1C will give you much more info than the fasting glucose will. On another note, I'm sure you're relieved to get those pizzas behind you for a while! LOL! The only thing I think that is worse than public school food (on the whole) are MREs and Nutraloaves. I love this blog so much. You've opened my eyes to what one person can do. You've also directed me to some other really good blogs with your guest writers. Thanks for getting this conversation going and keeping it going. I was wondering… you mentioned that your school has done away with official recess. Are teachers at your school allowed to take kids out to play as part of your daily curriculum? What if next year, you (and maybe some other teachers sick of having wiggly students all day) took it upon yourselves to give students a 5 or 10 minute outdoor break every day, where you serve as yard supervision? I just remembered that my first grade teacher used to give us a bonus recess near the end of the day (if we were good), only 5 minutes or so, but it made all the difference. She'd sit out there and watch us, and blow her whistle when it was time to come in. Looking back, I bet that little 5 minute break made the last hour before school got out a LOT easier on everyone. I actually think this looks like the only "good" pizza i've seen on this blog. but then again I LOVE my pizza well done with cheese burnt! 1. Insurance might not pay for it this time around- just doing it for curiosity's sake isn't necessarily good enough for them, even if your doctor is creative in coding it. Part of the reason the healthcare system is is a financial crisis is people getting tests (bloodwork, MRI's, etc) that aren't necessary. Even if your out of pocket cost is low, the money for those unnecessary tests comes from SOMEWHERE. If you totally pay out of pocket… that's a different story. 🙂 Just saying… our healthcare dollars go somewhere and I'm not sure that unnecessary bloodwork on a healthy 30-something woman is the place it should go. It's interesting to see the bloodwork, however, isn't it? 2. Blood sugar isn't going to change much. You're not diabetic, right? The way your body processes sugar is complicated… but if your fasting blood sugar changed much, I'd be very very alarmed that something else is going on. We start getting concerned at 100… I'd be pretty surprised if yours was over 100. I intentionally cook my pizza like that. I'm with Kris, I like my cheese on the well done side. Another suggestion: A1c is more meaningful than fasting blood glucose, but Dr. Davis at Heart Scan Blog says the best risk predictor is to measure your blood glucose before you eat, and then every 15 minutes over a period of a few hours after you've eaten. The higher your sugar goes and the longer it stay elevated, the higher the risk for various health problems. It's also a great way to find out specifically which foods result in sugar spikes and which ones don't (hint: for most people, even unsugared oatmeal is bad news!). For more on this, search his blog (heartscanblog.blogspot.com) for "postprandial". 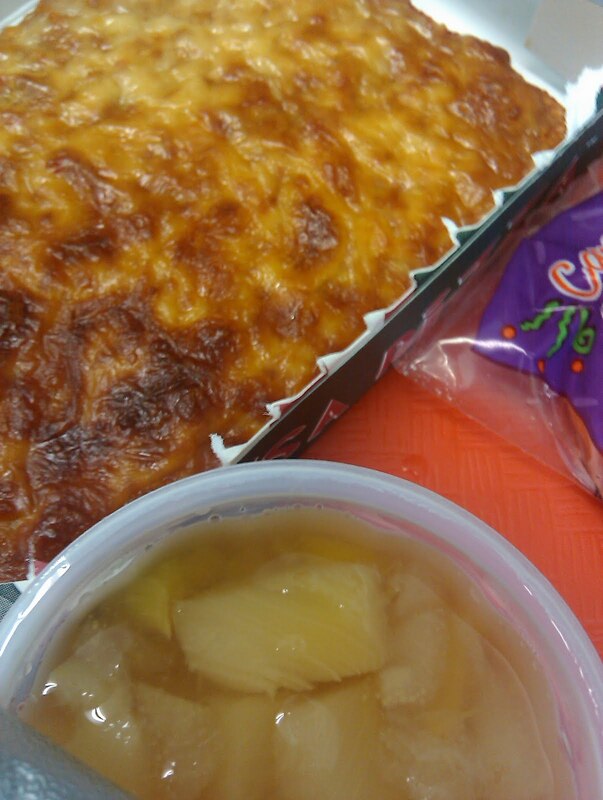 I was showing my wife one of your recent postings and she made the comment that the school food looks like airline food – and now I think about it, she's absolutely right. I don't want my kid to be eating airline food every day. That's just sad – for a country with so many resources we should be able to do much better for our kids. Thanks again for doing this blog – I'll be following along as long as you continue it. School food is about 10 million times better than food at [insert mental hospital's name here because I'm not sure if I'm allowed to say it. And no, I'm not crazy; I had an eating disorder. Ironic, eh?]. Like seriously, the whole eating disorder unit actually wanted them to bring us good, greasy fast food. The stuff there was just wretched. Ughhhh. Ew. the Pizza Looks Like Rubber. Well done Mrs Q. Well done. 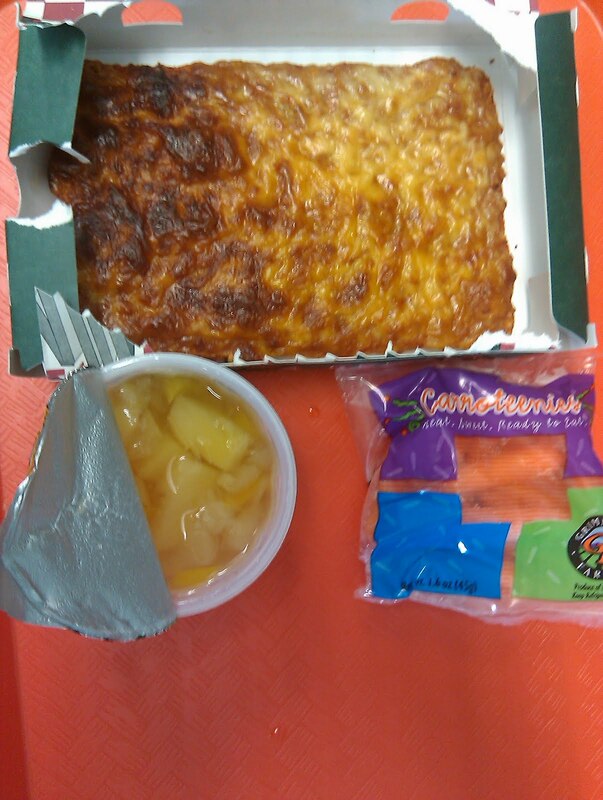 Is this really what school lunches look like now?? What's with all the packaging??? When I was in school (I'm 29), they fed us real food. I remember my favorite meal, it was chicken turnovers with gravy and green beans and mashed potatoes. I mean, it wasn't the greatest food, but it was set up kind of buffet style, in those big metal warming pan things, and the lunch ladies served it to us. What happened to that? Normal"/non-diabetic A1C is under 5.0. Diabetes is diagnosed at 6.0. A1C will give you much more info than the fasting glucose will. I'm diabetic and want to clarify this, a normal A1C is under 5.8, Type 2 diabetes is only diagnosed with a 2 hour glucose test, although if your A1C is over 5.8 it's a good sign you have it you'll usually be told to take a 2 hr GTT. Getting an A1C done is not a bad idea though. I really hope you continue this blog, busy as your life seems..it has made a difference in how I view my kids' lunches (the cafeteria is not getting another dime from me) and your blog has a lot of great links…I am a serious home cook and am thrilled to see you bring to light the issues surrounding this disgusting packaged food. In High School, as part of a program designed to learn more about the leadership in our community, we went around to various large businesses in the area for tours, one of which was the local prison. We ate a meal similar to what the prisoners got while the K-9 unit did a presentation. And, I can tell you their food was much, much better than public school food. I guess prisoners aren't as picky as kids, and thus will eat better? Thanks for all the tips. I am going to be paying for the test out of my own pocket because I don't think that my insurance would pay for the blood work since it was just done 6 months alo. I'll ask about the A1C. I do plan on blogging this summer but probably just once a day. Twice a day is a killer. Thanks to my fans! I agree, I think prisoners are fed better. Kind of a messed up situation. I have a very strong suspicion that you're fat. I'm kind of excited to see if I'm right when/if you "reveal" yourself. Oh and Jasmine, have you spent a lot of time in prison cafeterias? Or are you just of the mindset that criminals don't deserve to eat healthy food?